Har-Ber Village will host a short-term exhibit about baseball from March 30 through June 24, 2019. Memorabilia from local residents and former baseball players Gina Casey, Pat Dodson, and Matt Carnes will be on display in the Museum’s Visitor Center, Thursday through Monday, 9 a.m. to 3 p.m., free of charge. The All-American Girls Professional Baseball League (AAGPBL) was a professional women’s baseball league founded by Philip K. Wrigley which was in existence from 1943 to 1954. The AAGPBL is the forerunner of women’s professional league sports in the United States. Over 600 women played in the league. 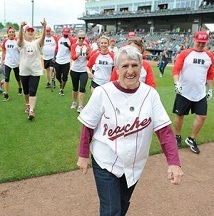 The most successful team, the Rockford Peaches, won a league-best four championships. The 1992 motion picture “A League of Their Own” is a mostly fictionalized account of the early days of the league and its stars. When she turned 16, and was old enough to sign the contract, the Townies added her to the roster. Casey was a second baseman for the Riverside Townies, while her sister, Alice Fracasso, was the catcher. The Riverside Townies, based in Rhode Island, was a minor league team for the AAGPBL in the 1940s and 1950s. In 1954, Casey hung up her cleats to marry, move to Chicago and eventually have six children. She now resides in Grove. Pat Dodson is a former first baseman with the Boston Red Sox from 1986 to 1988. He is currently the Superintendent at Grove Public Schools in Grove, Oklahoma. Matt Carnes was drafted by the Minnesota Twins in 1997. After nine professional seasons, Matt returned to his home in Miami, Oklahoma, where he began his banking career. On April 6, at 10 a.m., Har-Ber Village will recognize its 2018 volunteers in a short ceremony and has hopes of recruiting additional community-minded individuals throughout the day. As a special treat, volunteers and public alike can visit with Women’s Baseball League player Gina Casey in the Visitor Center Back Gallery from 10am-noon. Located at 4404 West 20th Street off Har-Ber Road, Har-Ber Village Museum is open 5 days per week, Thursday through Monday, 9:00 a.m. to 3:30 p.m.; closed Tuesday and Wednesday. The pioneer-era village, complete with Visitor Center, The Country Store gift shop, Nature Trail, Picnic Pavilion and Event Tent allows visitors to experience the area’s history and ecology as well as view collections of antiques and memorabilia. Adults $10; Seniors $7.50; ages 6-13 $5; under 6 and members free. For more information call 918-786-6446. The Café at Har-Ber Village is open the same days as the museum, from 9 a.m. to 3 p.m. The Café can be reached at 918-787-7617.